See below for how to visit Virginia Beach parks, and nearly 400 national parks, for free. - the most remote park in Virginia. If you want to see fabulous fall foliage go to www.nationalparks.org for their best fall foliage spots by state. You'll find details on hours, fees, and directions, plus a weekly fall color report-- a detailed guide on what colors are out at each park! For Virginia, they recommend Shenandoah National Park, and even have a Mountain Web cam so you'll know the best time to visit. Looking for a great campground? 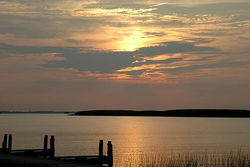 Here are some wonderful campgrounds near Virginia Beach and Williamsburg. 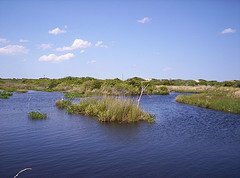 Which of the Virginia Beach parks has nearly 8,000 acres of marshes, sand dunes, beaches, and ponds? What is home to 300 species of birds, deer, mink, and other creatures? Back Bay Wildlife Refuge. To find out why Back Bay is a perfect place to stop, recharge, and get away from it all, click here. 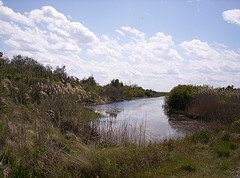 If your pulse picks up at the word "remote," don't stop at Back Bay Wildlife Refuge. This Virginia Beach park (only accessible through Back Bay) takes the award for Virginia's most remote park. False Cape is also one of the last undisturbed coastal environments on the East Coast. To find out why False Cape makes you feel like the first settlers when they met Pocahontas, click here. In the beginning, the locals thought it was a joke. Now the joke's on them. Despite it's hokey name, Mount Trashmore is a paragon of waste management. Why can't they do this with all dumps? What used to be 750,000 tons of trash has been transformed into one of the top Virginia Beach parks. Topped by its 68-foot summit (the highest point in the city, proudly flaunting "Mount Trashmore" on its grass-covered flank) this park has everything. Fly a kite or launch your model airplane from its summit. Feed the ducks and geese. Stroll on over to Kids Cove, a huge wooden playground featuring mazes, bridges, ramps and slides. The perfect place to play pirate! One caveat: this park is so popular it can get crowded! Still, where else can your kids boast "I played in a dump!" Open 7:30 am to sunset. Location: 310 Edwin Dr. - Virginia Beach - 757-473-5237. Yes, you...um...they...will be thrilled to burn off that excess energy conquering the innovative playground's swinging tires and climbing towers at one of the most innovative Virginia Beach Parks. What is Frisbee golf? Just how it sounds. Substitute a frisbee for a golf ball and a flick of the wrist for the 5 iron. Just what the doctor ordered. Open sunrise to sunset. Location: First Court Road - Virginia Beach - 757-460-7569. Here's How to Visit Virginia Beach Parks for Free! Ahh, nature. Seems like it should be free, and at 300 US National Parks it is. But 117 US National Parks-- such as Historic Jamestowne and Yorktown Battlefield-- charge an entrance fee...unless you're visiting on select fee-free days. Current members of the US military and their dependents, those with disabilities, and parks service volunteers with 250 hours or more of volunteering get an annual pass for free. In addition, current 4th graders can get a free pass good through August 2018. The price increases are apparently designed to fill at $70 million annual operating gap and will be used to fix up park facilities. For details, go to the National Parks Service. Want to Save Money on Food, Entertainment, and More? And for the latest ticket deals, free events, coupons and more, don't forget to check out our Virginia Beach Blog Daily Deals!